Little B is now just shy of 13 months and from the beginning he's had a taste for spicy foods--I attribute this to the massive servings of Korean and hot, hot curries I ate while I was pregnant. He loves his avocados mashed with a touch of Cholula. He prefers his hummus with a spicy kick. He's fond of Eritrean food. And when I met Lawman for lunch on Friday, Little B was determined not to be left out. 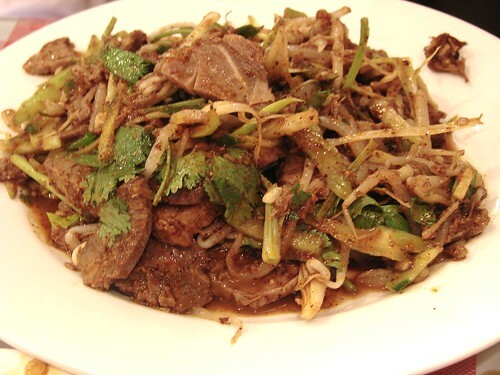 The spicy and tingly leg of lamb salad ($9.75) is on the expensive side for a lunch in Chinatown, but you get a ton of lamb. The cilantro lends a freshness to this cumin heavy dish. Little B wolfed this one down. To be honest it was a little heavy on the cumin for me, but he kept coming back with insistent "mo-ah, mo-ah, mo-ah." The "stewed pork burger" ($2.50) was a hit with both of us. While not a traditional burger, this was more of a Western Chinese take on pulled pork. The pork itself is super moist on account of being soaked in a meat broth and then diced into small pieces sandwiched in a crispy bun. This was the least fiery of the dishes we ordered, but the meat was rich and the perfect size for someone who has four workable teeth. My favorite dish of the day was the Liang Pi Cold Skin Noodles. 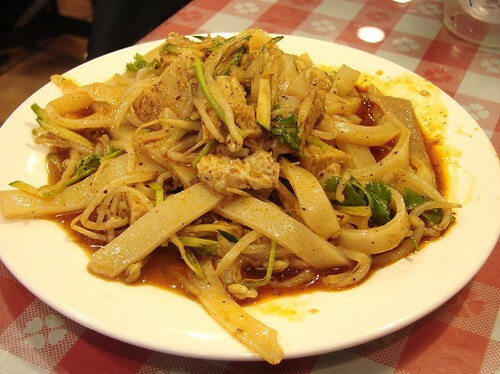 There's so much in this dish to love--the toothsome yet chewy hand pulled noodles, the softness of the gluten cubes. This dish is at once spicy and tangy. I could eat several plates without getting bored. 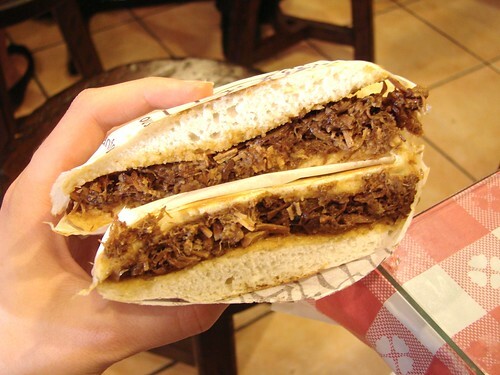 Hope to bring Little B back soon to check out their lamb burger and other noodle dishes. I'm really enjoying your blog! I love getting feedback on NYC spots. I always seem to amble around Chinatown looking for something good. Now I can actually make a plan to go somewhere specific. This place sounds great. I read this post and went to Xi'an that very night. I've been dreaming about going back for the Liang Pi Noodles ever since. You have made me an addict! I read this post and went to Xi'an Famous Foods that very night. I'm now addicted to their Liang Pi Noodles. Favorite dish for the summer!